Voltage Inverter - What is it? What is it used for? 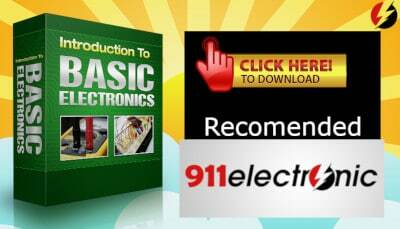 911 Electronic > Circuits > Voltage Inverter – What is it? What is it used for? Voltage Inverter – What is it? What is it used for? Voltage inverter is an electrical device that converts direct current (DC), which it is supplied with to alternating current (AC). 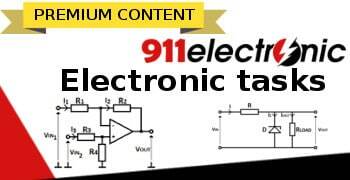 Its task is to generate an output voltage with adjustable frequency and RMS value (Root-Mean Square). Voltage inverters are supplied from a voltage source with a constant or adjustable voltage (usually a non-controllable silicon rectifier). A block diagram of a circuit with a voltage inverter is shown in Fig. 1. Inverters with pulse width modulation (PWM). Transistors are adjusted to conduct in pairs: ”T1, T4” and ”T2, T3”. After switching off the pair of transistors ”T1, T4”, the current of the receiver is closed by diode ”D3”, capacitor ”C” (or voltage source) and diode ”D2”. The receiver current value tends to zero. The receiver’s voltage has the shape of a rectangular waveform, while the shape of the current depends on the character of the receiver. The frequency of changes in the voltage and current of the receiver is regulated by changing the switching frequency of the pairs of transistors. If the inverter is to generate output voltage in the form of a rectangular waveform, each of the transistors is activated for conducting for half a period inverter operation. 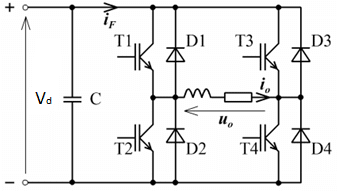 Switching on transistors ”T3” and ”T5” is shifted relative to switching on the transistor ”T1” by 120º (2/3π) and angle 240º (4/3π) respectively. Switching on transistors ”T2”, ”T4” and ”T6” is shifted relative to switching on transistors ”T1”, ”T3” and ”T5” by 180º (half-period). Remember! Two transistors in the same branch can not be switched on simultaneously! Rectangular waveform control mode – In order for the inverter to generate a rectangular waveform at the output, each transistor must be adjusted for conduction for half the period of operation of the inverter. 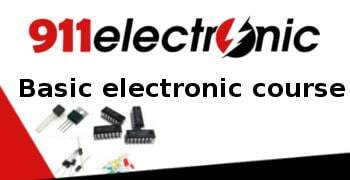 With this method of control, the output voltage of the inverter (thus the current of the receiver) is characterized by a high content of higher harmonics, which is a disadvantage of this type of transistor control. It is a requirement that two transistors are not switched on in one branch at a time. Pulse width modulation control mode – PWM control is characterized by a much lower content of higher harmonics than the rectangular wave control. The waveform of the output voltage from the inverter is a series of a rectangular pulse with a constant amplitude value and variable pulse duration. The controlling signal has the frequency that the inverter output voltage should have. The effective value of the output voltage is adjusted by changing the amplitude of the controlling signal. For this reason, inverters working with pulse width modulation (PWM) are usually powered by non-controllable rectifiers (diodes). 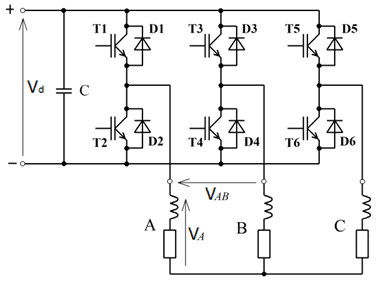 Hysteresis control mode – It involves switching vectors of the output voltage of the inverter in such a way as to keep the error vector of the current within the set hysteresis zone. In three-phase inverter systems without a neutral wire, the change in the current of one phase is connected with the current change in the remaining phases. 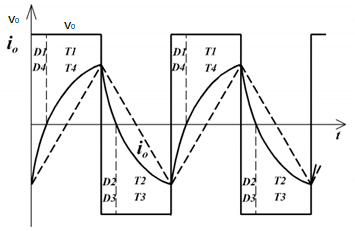 Therefore, the switching of valves in the same branch of the inverter (if the current in the phase connected to it exceeds the limits of the hysteresis zone) leads to undesired operating states depending on the direction of the electromotive force.